Grammy-nominated producer/rapper El-P of Run the Jewels has been tapped to compose the original score for the Al Capone biopic Fonzo. The movie is written and directed by Josh Trank with a cast that is led by Tom Hardy as Capone, Linda Cardellini, Jack Lowden, Matt Dillon, and Kyle MacLachlan. Fonzo recently started production in New Orleans at the beginning of the month and Hardy has shared some set photos of himself as the infamous gangster Al Capone. 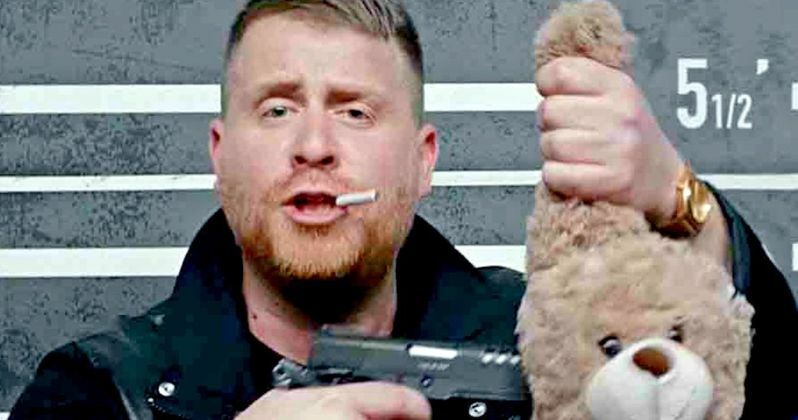 El-P is known for his use of vintage synthesizers and hard-hitting drums in his productions with Run the Jewels as well as his many other projects. The producer was in the running to score Denis Villeneuve's Blade Runner 2049, but the gig ended up going to Hans Zimmer and Benjamin Wallfisch. Now, El-P is finally getting his wish to get into scoring motion pictures with Fonzo and he's really excited about the opportunity. He had this to say while sharing a picture of himself and Tom Hardy. "Cats out the bag. I'm scoring Fonzo. Psyched to get the chance to do this sh*t. In celebration, here's the only picture i can possibly say i arguably look more handsome than @tomhardy in. Thank you @joshuatrank and everyone involved for giving me this opportunity to get weird." Fonzo director Josh Trank is a massive fan of El-P and all of his work. The director goes as far to say that the producer has been an influence on his life since he was a teenager. The combination should prove to be interesting, and El-P is promising that it's going to get weird, which sounds awesome. Trank says this. "Since I was fourteen years old, El-P's music has been one of the most important creative influences in my life. There's literally no greater honor for me than to collaborate with him today and bear witness to this next stage of his artistic journey." Musician, rapper, and performer Jaime Meline, aka El-P, is a distinguished producer known for his unique musical approach that sets him apart from his peers. He's arguably best known for the rap group Run the Jewels, which features El-P's friend and collaborator, Killer Mike. The duo just wrapped up a tour with fellow Grammy nominee and pop superstar Lorde and had one of their songs, "Legend Has It," in the Black Panther advertising campaign. 2017 was a huge year for the group and 2018 is already off to an awesome start. Fonzo tells the story of a ruthless businessman and bootlegger who ruled Chicago with an iron fist. Al "Fonzo" Capone was the most infamous and feared gangster in American history. At the age of 47, following nearly a decade of imprisonment, syphilitic dementia rotted Capone's mind, which Fonzo will use to show his past becoming his present, as terrible memories of his violent and brutal past come screaming into his waking life. You can check out the announcement of the musical collaboration below, thanks to El-P's Instagram account.